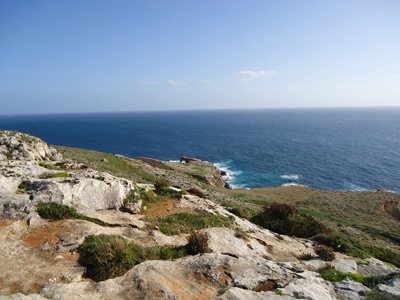 Ħaġar Qim is about 7,000 years old. Who built this temple complex, and what was it used for? 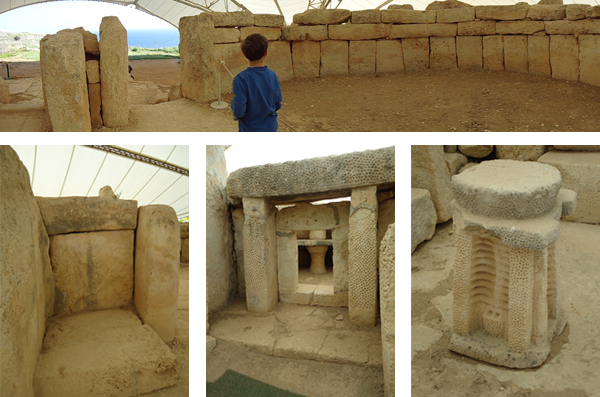 One of the main attractions of Malta are their many prehistoric temple structures. There are a few on the main island as well as some on Gozo. The history one can see and touch will leave you enthralled. Each day I try to get Aidan and I out of the flat. Sometimes we walk around our neighborhood to discover local shops, talk to people, collect seaglass, and generally familiarize ourselves with our new surroundings. My son is a wonderful companion and explorer. On this day we decided to try out the local public transportation system and brave the two transfers that would take us to Hagar Qim and Mnajdra, two of the oldest megalithic structures on earth, arguably pre-dating the pyramids of Egypt. We start out from our flat in Sliema. I had packed us a nice lunch, squeezed it into a small pack, then we made our way downstairs to the bus stop which is conveniently right in front of our place. The people in Malta are very friendly, and I have had no qualms about walking up to strangers and illustrating my lack of knowledge. I usually always find someone who speaks English well enough to understand the help I seek. We immediately learn that we just need to get a bus that will take us to the capitol of Valletta. The Valletta terminal is located at the City Gate square, surrounding the Triton Fountain, sculpted in 1959 by Vincent Apap. This now serves as the hub for the countries entire bus system. As far as I know, all buses begin and end here. From Sliema, we could jump on one of several buses, then take the express (X4 or X5) to the airport. 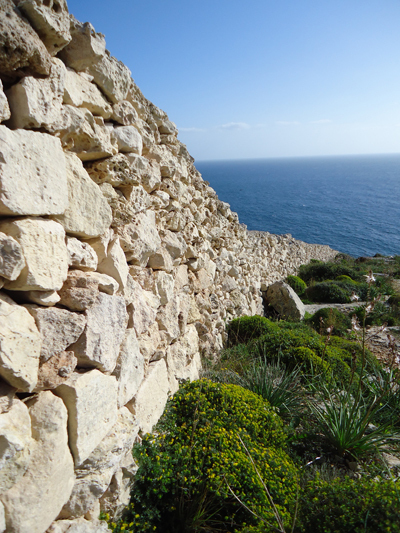 Once there you take the 201 to reach the Blue Grotto and Hagar Qim. But beware – a mis-timed arrival at the airport could mean you wait a while for the next bus since they arrive only once per hour (and vice versa on return). Time your day accordingly for some waiting. As soon as you arrive you notice a large protective structure that shields the temples from wind, rain, and solar radiation. It also inhibits plant growth. By no means permanent, it does hinder the deterioration process that has been occurring over the centuries. It’s not the most attractive structure, but I do have to appreciate the invaluable protection it must provide. Perhaps someday they will have a new technology that will preserve these sites without the need to cover them so. I was absolutely entranced by these two temples and the views of the surrounding Mediterranean sea that the sites offered. My appreciation for things this old is obviously related to how old I am. My son, barely nine, tended to be less interested, especially since we didn’t find any 10,000 year old artifacts like I had promised (you have to promise them something treasure-like, or how else will you get them to come along!). Unlike the states, the temple areas are ‘loosely’ guarded and I was amazed at how easily people could touch the stones. The areas directly around the temples are fenced to keep vandals from striking again with graffiti and the dislodging of megaliths. However, the areas leading to the the cliff edge are wide open for exploring and it made for a delightful and picturesque excursion from the beaten path. I highly recommend this day trip, and the Blue Grotto nearby looks like it would be beautiful as well when it gets warmer.